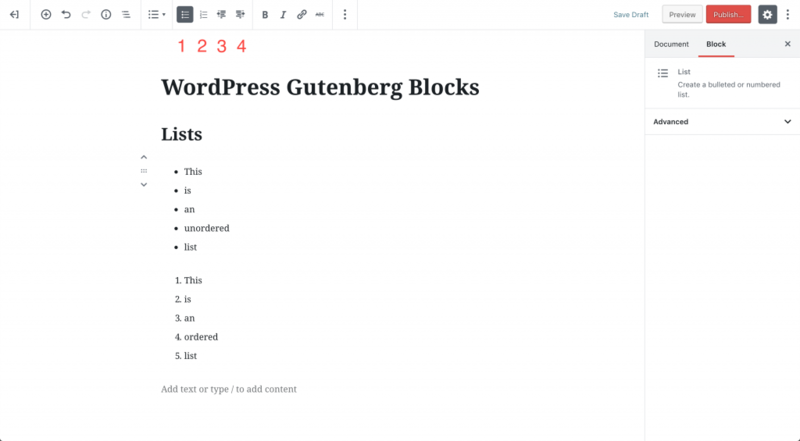 What are 12 things you should know about the Gutenberg WordPress editor? Gutenberg is the new editor for WordPress and is easily accessible once you update to WordPress 5.0. This is not to mean that the standard editor will instantly become obsolete. The standard editor will be available to users for a few more years. Further development of the Gutenberg WordPress editor will continue in the Gutenberg plugin. 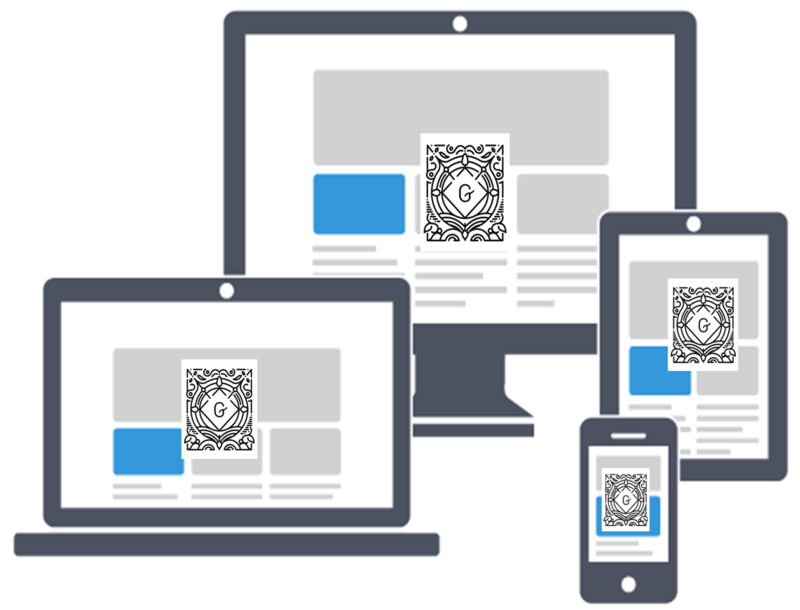 You can therefore directly contribute to the development and fine-tuning of Gutenberg by giving feedback after testing it. It is advisable that you test the beta version in a testing site and not on your main site. The layout of the Gutenberg editor is responsive and makes navigation through different devices easy to learn and use. The editor has been designed to work on different devices such as computers, mobile phones, and tablets. The editor also works on different screen sizes. While Gutenberg will automatically become the main editor for WordPress, you are still able to access and use the classic or standard editor. 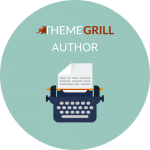 The content you create using the classic editor can be edited with the Gutenberg editor. The opposite also applies. Content from Gutenberg can be edited using the classic editor. You only need to install a plugin for the classic editor. Furthermore, making use of this feature will not disable your site even though Gutenberg is the main editor. The editor makes usage of shortcodes, widgets; post formats as well as HTML a thing of the past. Whereas the classic editor relied on these elements to fully function, Gutenberg simplifies the process by using blocks of different group elements put together. This makes it easy to make use of these elements to enrich your document with media. Some of the blocks available include paragraph, headings, quotes, audio, and video blocks. It will also be possible for you to present text and any media side to side with ease. The Gutenberg WordPress editor simplifies navigation through the different blocks you use to structure your content. If you want to adjust or examine a particular block, the editor offers a panel that has listed the different blocks you have used. The blocks are listed in the same order as they are used in your document. There are instances where formatting was lost or wrongly organized when pasting formatted content. This would happen in the testing stages of the editor but has been rectified. In the classic editor, copy content from other platforms such as Google Docs and Microsoft word was not pasted in the original format. Gutenberg has made significant improvements to the copy and paste process to maintain the format of the copied content. 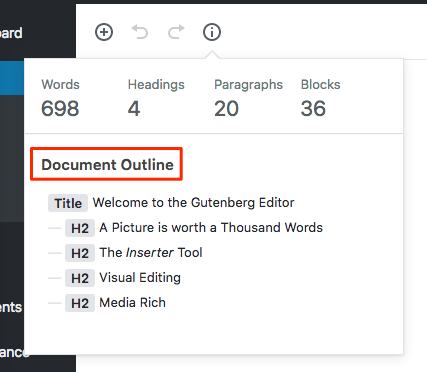 Gutenberg offers the user an information button that allows you to check on the word count of your document. You can also check on the number of paragraphs, blocks, and headings you have in your document using the same information button. This information is available to you as you work making it easier to review and adjust your work appropriately. The editor has a heading block provided under the information button. The document is automatically outlined based on the headings you use as you write your document. You, therefore, do not need to scroll through the entire document to get to a particular section or your work. You can simply select the heading you want, and you will be directed to the section. Stopping the writing process to add media to your document disrupts the flow of writing. Gutenberg editor allows you to use a placeholder block so you can proceed with your writing. Once you are done, you simply return to the placeholder and upload the media you intend to use. You don’t need to select the embed block with Gutenberg. Simply pasting the copied link onto the appropriate block automatically embeds it. The editor detects and converts the link into content that is viewable. You can further add captions, if you wish, to the bottom of your embedded content. There are shortcuts available to you when using your personal computer to ease the insertion of a new block or select multiple blocks at the same time. The Gutenberg editor makes it possible for multiple users to edit different sections of the same document without interrupting each other. Furthermore, with content blocks, you can use a designated block for internal notes by other purposes. Comments can, therefore, be made by others on the content of the document. 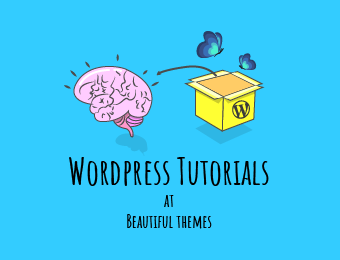 According to techiespad, at first glance, the Gutenberg WordPress editor may appear challenging to understand and use, but this is not the case at all. The adjustments that have been made have been carefully developed to make the editing experience more favorable to you as the user. Gutenberg is easy to use regardless of your previous experience with WordPress. Embracing this change will significantly advance the manner in which you work and present your content to the world. Shaira Williams is a tech enthusiast and blogger. 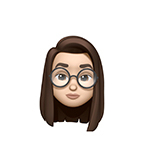 She writes about technology, apps, WordPress and a variety of other topics. In her free time, she likes to play golf and read books. She loves to learn and try new things. 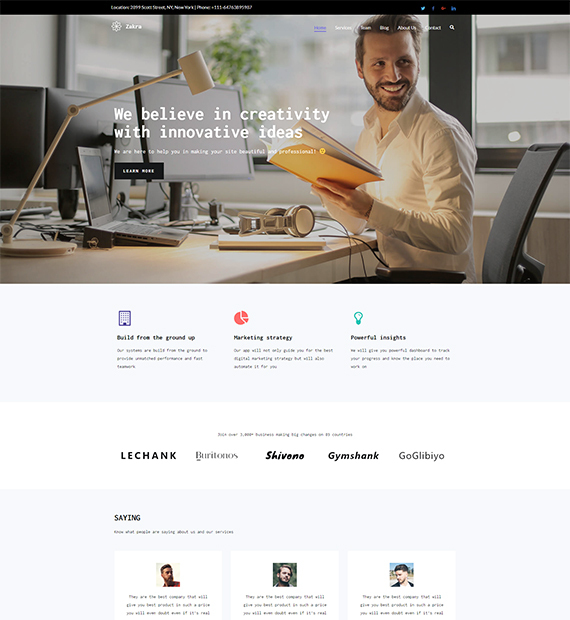 The Gutenberg WordPress Editor is the latest trend or topics for WordPress developer.